The International Reciprocal Trade Association (IRTA) is conducting its bi-annual statistics gathering effort to determine valid and reliable barter industry statistics. This information is increasingly important as business communities, media, governments, and financial industries around the world continue take notice of our industry. Bentley Commerce Corporation (OTCBB:BLYC) has announced the introduction of its Platinum Business Trade Card. The first debit card that seamlessly processes barter exchange members’ trade purchases at the point-of-sale at participating merchant members worldwide, even if the buyer and seller are members of different trade exchanges. The Platinum Card uses a standard credit card merchant terminal so that sellers do not require a separate terminal to process barter transactions. “This is Bentley Commerce’s next step in providing an integrated technology platform capable of real time trade transaction processing worldwide,” stated Bruce Kamm, Bentley Commerce’s CEO. “There are 74 participating trade exchanges, providing online trading and account management for about 15,000 member companies, that are already part of Bentley Commerce’s Global Trade Alliance. The members will be provided with debit cards branded with their exchanges’ logo to process barter now, and eventually cash transactions, at the point of sale,” Kamm explained. The first terminals that will process Bentley Commerce’s card transactions are VeriFone Omni 3750 and 3300. Bentley plans to support additional terminals, such as the Nurit 8100 and 2085, later this year. For members in the U.S. and Canada that do not have a swipe card terminal, transactions can be processed via touch-tone phone with one toll-free number to call...24/7. For more information contact Bruce Kamm (646) 825-9001; e-mail bkamm@bentleycommerce.com; or see www.bentleycommerce.com. While the number of farms in New York continue to decline, by over 1,000 in the last five years, the number of wineries has grown from 20 back in 1975 to today’s 194, according to the New York Wine & Grape Foundation. The boom isn’t limited to New York. With more than 3,000 wineries in all 50 states, wine pours more than $45 billion into the U.S. economy and employs 556,000 people, according to WineAmerica, a trade association representing 800 wineries. California is the largest wine producer in the United States, accounting for 90% of the production. New York is the third largest producer and ranks fourth in the number of wineries, after California, Washington and Oregon. Editor’s Note: Our cover story on Active International (the largest corporate barter company in the world) in issue #56, reported on a major breakthrough for them. It occurred some 15 years ago when they secured the nation’s second largest winery—Canandaigua Winery in upstate New York—as a client. They are still an account of Active’s. Certainly, with some 3,000 wineries across the U.S. the opportunities for barter companies to work with this industry offer great promise. “Early indications are that this year’s 20th anniversary NATE Convention at the Venetian (in September) could be the largest of all time. Response to the announcement of the outstanding programs planned, such as the E-Myth trainer and the Sandler sales trainer, have been fantastic. “The two-for-one package offering to long term members has enticed, and is bringing, some exchanges that seldom attend annual meetings. Other owners, who usually don’t bring salespeople or brokers to the convention, are doing so this year. “Between the Directories USA program, the Selling Power magazine subscriptions, and a personal copy of the E-Myth, plus the great speakers for this year’s event, this our best year ever of giving back to our members. “At our 10th anniversary convention our theme was, ‘It’s Great To Be In NATE.’ I can tell you that now, 10 years later...it’s even better to be in NATE.” For more information on NATE: www.nate.org. TheBarterStore.net was introduced in January, 2004, and according to its developer, Israel Rivera of Barter of America, it is a store for the members of the barter industry. The site accepts various barter currencies for purchase of scrip, certificates, notes, and due bills. Some translation is also available, in Spanish and German. 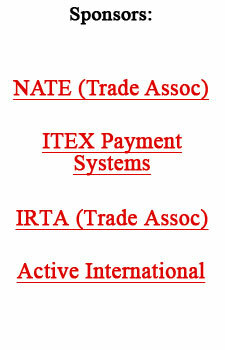 Trade exchanges interested in implementing the “Barter Debit Card” on their system should call (619) 516-5300 for details. Follow-up to our July 13 story, regarding a glut of advertising time available, which suggested it’s time to make fundamental changes. . .
Lawyers’ advertisements seem to be everywhere. They are so commonplace it’s hard to believe that fewer than 30 years ago the U.S. Supreme Court forbade them in any form. Last year lawyers spent $384 million nationally on local television, radio, and print ads. Legal services was the 15th largest spot TV category in 2003 based on aggregate spending in the top 100 demographic markets, according to Susan Cuccinello of the Television Bureau of Advertising.